All hail lord Saitama! The anime Gods has blessed us once again with another marvel a few months ago with One Punch Man. I'm a fan of superhero anime, though I haven't seen much, the ones I have seen like Gatchaman Crowds and Tiger &Bunny have not failed to entertain me. Knowing the hype surrounding One Punch Man plus knowing that it's a superhero-based anime, I was more than pleased to begin watching it. One Punch Man is plain and simple, our hero Saitama drifts around fighting crimes. In terms of plot, there's not much more too One Punch Man than that. So why is there so much hype behind this anime? The magic potion to the success of One Punch Man in my opinion is based around three things: the art, the lack of recognition for Saitama's skills and Saitama himself. I think one thing that fans of One Punch Man really want to see is Saitama getting the recognition he does not get within the 12 episodes of the show. I felt so sorry for the poor guy when people like Tanktop Tiger (lol) tried to discredit Saitama from saving a city from a disaster. This is also a problem when we have Saitama discrediting himself, like after the Deep Sea King arc where he discredits himself and awards the accolades to his fellow heroes. Give Saitama the recognition he deserves! Saitama needs to be put in S-rank, please. Saitama is the ultimate key to the success of One Punch Man. Those facial expressions, his comedy, his abilities, the satire surrounding his character makes him so much fun to watch. When I initially read the title of the anime, nothing came to mind after reading the title. After watching the first episode and seeing Saitama defeat the first villain with "one punch," it finally clicked in my brain and at that point I got it. The title of the anime is embedded with Saitama's abilities as a superhero, which is so damn smart of ONE and Yusuke Murata. You'd expect in a typical superhero-based show that superheroes keep their cool during tense moments. That's not exactly true for Saitama. I adored those silly facial expressions Saitama makes during "serious" moments in the anime, it adds to the satirical value of the show making it hilarious to watch. Madhouse did a great job with the art and animation of the show. The movement during fight scenes were flawlessly done, the colouring of all the character's were great, and that "contouring" of Saitama's face was an excellent tactic to separate the guy's state of mind. I feel like my review doesn't do the anime justice. You have to watch the show to experience the fun of One Punch Man. It's a simple anime that's meant to be playful and joyful to watch, it's not meant to be interpreted like a piece from scripture (like I see when others review this anime). If you do decide to watch it or if you've already have watched it, I'm sure you'd enjoy every aspect the anime had to offer, since I absolutely enjoyed it. Thanks for reading, that's it for this review! 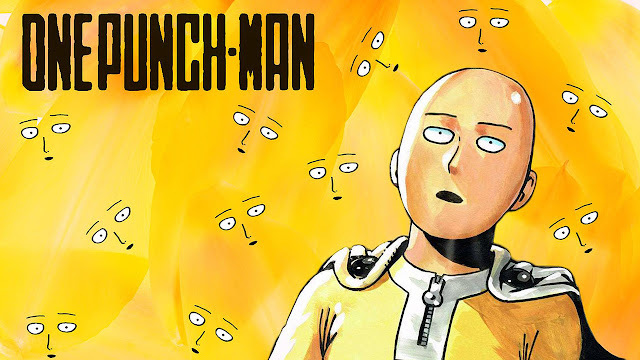 Please comment down below on your thoughts about One Punch Man, I'd love to hear your thoughts on g0dly Saitama. Ahem, by the way; I like Genos more than Saitama. Man, i love the Madhouse animation; but in One-Punch Man they really showed off. Just two scenes are needed to see the series level: the genos and saitama training, and the boros and saitama fight.